According to a tradition in the Eastern Orthodox Church, Simeon had been one of the seventy-two translators of the Septuagint. As he hesitated over the translation of Isaiah 7:14 (LXX: "Behold, a virgin shall conceive...") and was going to correct it to γυνή (woman), an angel appeared to him and told him that he would not die until he had seen the Christ born of a virgin. This would make him well over two hundred years old at the time of the meeting described in Luke, and therefore miraculously long-lived. What does the scripture mean by “the consolation of Israel”? In the Latin it is the word consolationem and in the Greek it is the word paráklēsis, which means a calling to one's aid, encouragement, comfort. Paráklēsis is the same linguistic derivation as paráklētos ("legal advocate") and thus has legal overtones. paráklēsis comes from the same original word or root as paráklētos. No one could do it. That's why there was all kinds of sacrifices under the Jewish Law. “For it is impossible that with the blood of oxen and goats sin should be taken away.” (Hebrews 10:4). 26 And he had received an answer from the Holy Ghost, that he should not see death, before he had seen the Christ of the Lord. The Holy Ghost had told Simeon that he would not see death until he saw the Christ. “The Christ” comes from the Greek word Christos, meaning “anointed one” or “chosen one”. As we will see Simon will recognize Jesus as being the “chosen” the “annointed” mediator. On a spiritual note, You may be tired of living in sin and want out of it. St. Paul says we must die a daily death to sin. But until you can see Jesus in the Eucharist for who he is... the mediator between God and man, the “consolation”, you will not die the death St. Paul talks about. Where was this Consolation that Simeon was waiting to see? He was in the Temple. One definition for temple is “A place in which the divine presence specially resides.” The divine presence of The Christ was in the Temple. That is why the Spirit led him into the temple. Where do you go to find Christ our mediator? 32 A light to the revelation of the Gentiles, and the glory of thy people Israel. Simeon not only was saying that this child would be a consolation, this child Jesus was not only going to be a mediator, Jesus Christ the anointed one the chose one was our salvation! 33 And his father and mother were wondering at those things which were spoken concerning him. 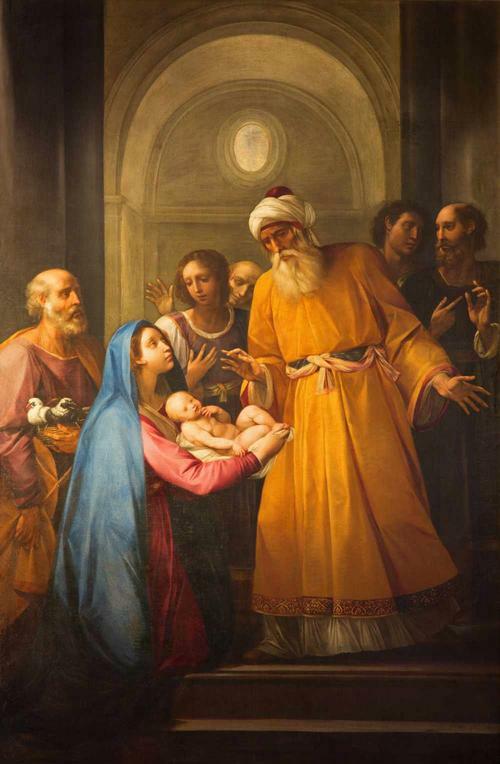 What did it mean that St. Joseph and the Blessed Mother were wondering? I would agree with Jansenius for two reasons. One, because he used the same word in verse 28 when “he blessed God” And two, the misunderstanding of what it means to bless some one. The word Blessed in the Greek is the word eulogéō. Our English word is eulogy. To eulogize is to “praise highly in speech or writing.” The Hebrew word for blessed is barak which means to kneel, to bless. So put the two together, to bless someone is to say good things about them or toward them. A type of adoration. Pictured in a kneeling position. Putting someone ahead of yourself by your words of praise. You may say, “I understand when we would kneel before God and adore Him? But how about the scripture that says 'The Lord bless thee, and keep thee. ' (Numbers 6:24)? How can we define and picture the word blessing as if God is praising us, is showing adoration to us on His knees? Here is the picture. When we praise God we in humility are kneeling before our Father saying great things about him, showing him our adoration. But when God blesses us, he is kneeling before his children. That is he getting down to our level so that we can be eye to eye. He is saying great things about us as a father would say great things about his children. He is adoring us as a father would adore his child. Do you see it? Notice. He had the whole family in on the blessing but when it came to the prophecy, he will leave St. Joseph out of it. Why? I believe Simeons prophecy was also a hint to the Holy Family that St. Joseph would not be around for the fulfillment of the prophecy. He will have passed away by then. The allusion in the next verse is to Isaias 8:14. (that is), "for a gin (noose) and for a snare to the inhabitants of Jerusalem;" (Isaias 8:14) and in Isaias 28:16,"Therefore thus saith the Lord God: Behold I will lay a stone in the foundations of Sion, a tried stone, a corner stone, a precious stone, founded in the foundation. He that believeth,let him not hasten. " 35 And thy own soul a sword shall pierce, that, out of many hearts, thoughts may be revealed. This was not just any kind of sword. In the New Testament there are in the Greek two swords mentioned. Machaira: a short sword or dagger-a short sword or dagger mainly used for stabbing. Rhomphaia: a large, long "broad sword" that both cuts and pierces. copyright © 1987, 2011 by Helps Ministries, Inc.
Two types of swords were used in the biblical times, the single edge and the two-edged sword. The single edge was used most effectively by swinging it and hitting the enemy to lacerate the flesh. The blade could be straight or curved to a great degree. In the latter case the sharp edge of the sword was on the outside of the curve. The double-edged sword was used primarily for piercing rather than lacerating, though it could obviously be used either way if necessary. The sword mentioned in Luke 2: 35 was the. Rhomphaia: a large, long "broad sword" that both cuts and pierces. Out side of the The Apocalypse Of Saint John (Revelation), this is the only time that this sword is mentioned. All other references for swords in the New Testament is the Machaira: a short sword or dagger-a short sword or dagger mainly used for stabbing. By knowing this, you can see what the heart of the Blessed Virgin went through for the love of her son. It was more then just a stabbing with a Machaira, it had a lacerating, stabbing, slicing, cutting effect of the Rhomphaia. Why did she have this "piercing of the soul"? So she could feel as strongly as her Son felt. She felt deeply the love Jesus had for others when he wept for Jerusalem. She felt deeply the righteous anger Jesus had when he overturned the tables in the Temple. She felt deeply the pain, the thirst, the commitment Jesus had to the cross knowing that what he did would save us from our sins! Their hearts beat as one. Her Immaculate heart was beating as one with his Sacred Heart as an example to us. St. Augustine tells us that she was more blessed in having borne Christ in her heart than in having conceived him in the flesh. Some words from an old secular song, "My endless love", by Lionel Richie, came to mind as I was concluding this devotion. In the song was the phrase, "Two hearts, two hearts that beat as one". May this be our desire and goal in our relationship with the Sacred Heart.